There are the normal operating procedures on a mine designed to get everyone home safely every day. Then there are the everyday incidents that remind miners of the possible dangers that they face if the rules are not followed. For instance, a driver descending an incline in the wrong gear puts stress on the braking system which could result in a brake failure. Or rain could make controlling a front end loader difficult and dangerous. 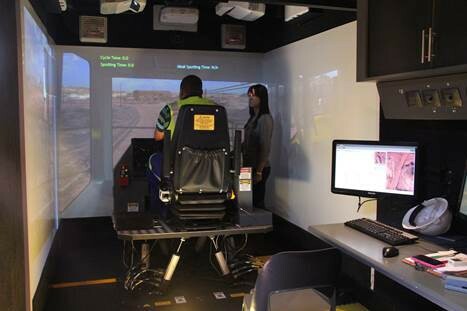 Anglo American’s Kumba Iron Ore Sishen operation have been making operations at the mine safer by using simulators to train their operators to deal with real life work situations like these. Simulators have helped to bridge the gap between theory and best practice equipment operations. The simulators are not just computer programmes but hyper realistic systems and modelled vehicles that operate in a 3D world, emulating the Sishen operations. Wynand de Klerk, Sishen’s senior training officer, say that simulator technology enables his trainees to learn, practice, and repeat procedures as often as necessary in order to correct mistakes, fine-tune their skills, and optimise outcomes. Wynand believes that Sishen’s safety record, lost time injury frequency rate (LTIFR) of 0.10 per 200,000 hours worked, is down to the fact that operators can develop and refine their skills without compromising the safety on the mine. Sishen’s training facility also allows Kumba Iron Ore employees to be trained to react safely and efficiently to emergency situations like a brake failure or engine fire. 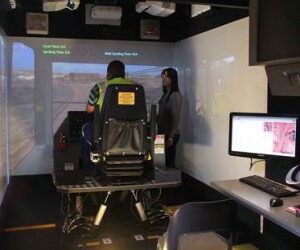 Novice operators are given at least three months training on a simulator before they are allowed to go near an actual piece of heavy machinery. This training programme, says de Klerk, allows the company to see benefits in three different areas: safety, productivity and best practice machine use. The simulators at Sishen allow instructors to set standard exercises and then inject different hazards into each scenario. The advanced computing system allows instructors to monitor real time operations and measure them against the student’s historical performance. It also allows instructors to replay each simulation with the trainee to help identify and work on shortcomings. The simulators – a tracked bulldozer, a wheeled bulldozer, and excavator, surface drill rig, haul truck, face shovel and front-end loader - cover the four critical mining processes: hauling, drilling, digging and loading. Training in these skills is also an ongoing process. Follow up testing in the simulators is conducted after the first three months on the job. “We run refresher courses for every operator every year. With the simulator we are able to test theoretical and practical knowledge,” adds de Klerk.